That’s awesome! I had not noticed that yet. I did figure out how to switch back to a previous channel by double clicking the play button. I’ll share this swipe/click down feature with my wife. I am sure it will make her happy. For those that request this, what are you actually after? Do you just want it because that’s how traditional cable boxes worked? Or is there a more specific thing you’re after? “Make the video play on the guide” is a result, not a problem solving feature. If we knew more about the problems you were trying to solve, we could possibly solve it another way. Your feedback would be really useful! Ultimately, I would love to see something similar to DirecTV's "Double Play" feature. For those unaware, on DirecTV DVRs, if you press DOWN twice on the remote, it opens a second tuner and presents that to the viewer while keeping the original program playing in the background. This means that the timeshift buffer of the original program is kept intact, allowing you to pause on one channel, switch to the other tuner to watch until a commerical, pause the 2nd tuner and switch back to the first and fastfoward through the commercials you paused at. (Yes, I'm aware that description is a bit awkward, but hopefully the gist is there.) Also, the second tuner for the "Double Play" feature is also used if you choose to do PIP. For Channels, the dual tuner feature would depend upon a Channels DVR server and Tuner Sharing being enabled. Also, bandwidth from the server to the client shouldn't really be an issue, as only the currently viewed stream would be sent to the client while the other "hidden" stream would buffer to the server. For a PIP implementation, the server could reduce the resolution and bandwidth of the smaller stream (the inner picture) and deliver the full-res stream for the larger stream (the encapsulating picture). This is what I do, and is perfect for me. I just wish this and the guide looped on channel list. When you are watching a channel (on ATV), you swipe down to bring up the favorite channels banner which covers roughly 20 - 25% of the screen while the channel continues to play. Why not add a third option tab at the top of that banner; in addition to "Favorites Guide", "Language", that says "Grid Guide". When selected, instead of the Favorite Channels banner covering 20-25% of the screen while the channel continues to play, you get a grid guide that covers more of the screen while the channel continues to play in the background. Just my two cents. I also have Directv Now and this is one feature they have that I miss when using Channels. But overall prefer Channels UI. For me if I am watching a show live but it is on commercial and want to see other channels it is nice that the show keeps playing while I review what else is on. I thought your problem with this feature and others like having multiple news channels showing on the screen at the same time was not using the Apple Video Player. I'm curious if THIS would seem sufficient for most of those in this discussion? There's at least one other thread that asks for a different solution (mini-guide) to the same problem. As far as I can tell, most just want to be able to browse what's on while still having TV playing because the alternative is frustrating and boring. Quite often one will be watching something and they're just curious what might be on later. I personally prefer the mini-guide solution and I think (though the devs can better speak to this) that this solution would be the easier of the two. Please weigh in, as the sooner we all get on the same page with this the sooner the devs can determine if it's a useful feature to work on immediately. YES. Exactly this! Great mock up! This is exaclyly what I’ve been hoping for. The frustrating part about using the grid guide is you lose the tuner and the buffer as soon as you hit the menu button. This makes It difficult to get back to the channel you were just watching. There is something about using a grid guide and the layout, it just works. Since the beginning of cable some sort of grid guide has been around. It’s a hard habit to break, while I like the favorites option, the wife does not. I love the mock option listed above. Love the app, we have it on all of our TVs. Keep up the awesome work! Indeed, most of the UI/UX issues are because of users' patterns of use. For instance, while many like the Discover type of panels that show current programs based upon a category, I prefer a grid because I can more easily see the progress into a currently airing program, as well as the next aired program, for multiple channels at once. This will aid in deciding whether to tune to an in progress airing using information such ad how much of the show is left and what will follow it; both criteria are used when selecting a channel to watch. How this feature isn't already included make this app a waste of money. Now I know why they don't let you try the app before buying. This app is missing so many basic features that its useless. Regret buying this app but I had no choice since they don't let you try before you buy. They do. You could sign up for the DVR service where you get the first month free, and then get the DVR apps for free. Also if you articulate your issues you have a better chance of a solution. Take a look at this forum...you are a very rare breed around here. Most people love this app and DVR software. On top of that, if you do a little research, the devs have already posted why this isn't a feature yet. 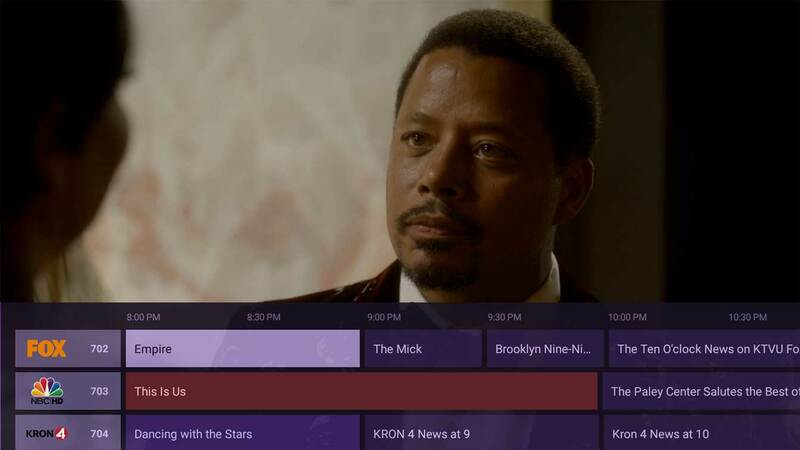 Personally I like seeing the video in the top right like TiVo has because I could be scrolling through the guide to see whats on, then the show I was watching came back on. I could then go back to my show and carry on. Am I the only one who uses the favorite preview for this? You can add all the channels or just your list of favorites and scroll thru. Granted you can't see what's coming up in 3 shows later, but at least you can see what's on any channel you setup and what's next while still watching the show you are on. Instant jump to other channel and you don't have to back out to the guide. I like it better than Directv or dish that I had used. iOS is a little tough as it's one at a time but on Shield and Apple TV you get to see a lot or channels at the same time. this would look very nice.